To me, the endoscopic-assisted facelift represents some of the most exciting innovations in aesthetic medicine. Smaller incisions, an abbreviated recuperation, and superior, natural-looking results make it one of the most promising procedures in my practice. In this blog post, I want to take a closer look at the nuances of the endoscopic facelift as performed at my NYC practice, including its technique, its advantages, and its future. Using a slender, flexible wireless instrument called an endoscope, I can visualize the deep, supportive structures of the face without making large incisions. This approach combines the benefits of a deep-plane facelift (or SMAS facelift) with the reduced dissection and relatively brief associated recuperation time of an endoscopic procedure. An endoscope features an extremely small wireless camera that is used to visualize an internal area of the body from a remote incision without “opening up” the area with an extensive direct incision. In addition to helping me see the area of the face I’m working on, an endoscope can do things that my eyes can’t do on their own, such as magnify tissue. This allows me to make very detailed adjustments that ultimately result in a more significant, attractive outcome. This approach can be customized just as a traditional facelift can, and it’s an appropriate option for men and women with various degrees of facial aging. In order to achieve these goals, I make small incisions, typically located beneath the chin, around the ear and by the hairline. After surgery, most incisions gradually fade to pale, indistinct marks that can be easily covered by patient’s hair. Most patients can expect to be in surgery for up to 3 hours. 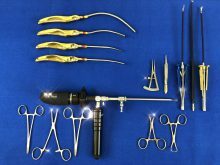 I tailor my technique to the patient’s unique goals, so the actual procedure steps can vary quite a bit from case to case. What’s Next for Endoscopic Facelift? While endoscopic-assisted brow lift is a common option in practices throughout the country, the adoption of the endoscopic-assisted facelift is still emerging. Over the past few years, I have developed and honed my technique, offering the exciting option of an endoscopic facelift to Manhattan patients. 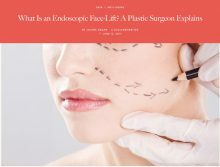 In a previous blog post, I shared that my endoscopic facelift technique was featured in Allure magazine–a major name in the beauty industry. As mentioned in the article, I’m working to introduce the technique to more surgeons around the country through presentations at industry meetings and conferences. Within the next few years, I hope to see endoscopic facelift adopted by more surgeons around the country and potentially the world, offering patients everywhere the opportunity to look their very best with minimal scarring.